Office areas have a tendency to be drab, neutral, and boring; some might even argue their spaces can be downright depressing. Fresh paint and a few plants can only do so much. If you're really looking for a way to liven up your office, find changes that bring a peaceful transition from the outside in. Shades offer an awesome opportunity, transforming the feel of your work space with a product that offers long-term solutions, adhering to any individual's particular preferences. Proper Ambiance for Presentations. If you've ever tried to conduct a meeting in a room flooded with sunlight, you already know the pitfalls; uncomfortable glare and no one will be able to see the screen. Of course, meetings happen all day long in the business world, and the sun never sits in one place. To account for any-time-of-day boardroom bookings, interior Sun Control retractable shades will make it easy for you to adjust the amount of light you let in. Preserving Your Office Furniture. Does it feel like it hasn't been long since you purchased new furniture for your office, yet it's already looking faded and worn? If so, UV light might be to blame. It doesn't matter how well you care for your office furniture if you don't have proper UV protection in place to preserve it. Shades made with sun control technology are specifically designed to filter and diffuse the sun's UV rays which have harmful effects on your furniture, flooring and decor. Increasing Energy Efficiency. When office makeovers deliver boosts to the budget, leadership will listen! Poorly-insulated windows aren't the only culprits for high energy costs within companies; bad blinds and overall lack of proficient window coverings account for a large amount of energy costs. When proposing change of office aesthetics to your executives, be sure to bring up the savings when your workplace is more energy efficient. Sun Control fabrics are engineered to absorb the sun's heat. As a result, rooms are kept at more controlled temperatures, retaining heat when it's cold and keeping the heat out when it's warm outside. Shades in a Variety of Shades. 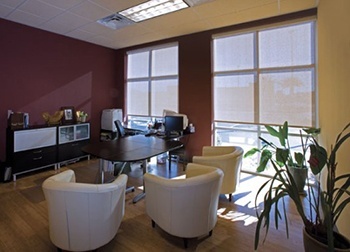 Office window coverings come in a variety of options, and each product has specific attributes. Ask an expert if you're not sure which is the best shade for you. Ready to revive your office and bring new light to your work environment? Download the Polar Shades Shades vs. Blinds guide to help you decide which option is best for your business!